EV71 occasionally cause a series of severe neurological symptoms, including aseptic meningitis, encephalitis, and poliomyelitis-like paralysis. However, the neurological destruction mechanism was remained to be clarified. This study described the cross reaction between EV71 induced IgG and human brain tissue. Cross reaction of the IgG from 30 EV71 infected patients' sera to human tissues of cerebra was observed, which suggested that some EV71 antigens could induce IgG cross-reactivity to human cerebra. To identify the regions of EV71 virus that containing above antigens, the polypeptide of virus was divided into 19 peptides by expression in prokaryotes cell. Mouse anti-sera of these peptides was prepared and applied in immunohistochemical staining with human adult and fetus brain tissue, respectively. The result indicated the 19 peptides can be classified into three groups: strong cross-reactivity, weak cross-reactivity and no cross-reactivity with human brain tissue according the cross reaction activity. Then, the increased Blood Brain Barrier (BBB) permeability and permits IgG entry in neonatal mice after EV71 infection was determined. EV71 induced IgG could enter BBB and cross-reacted with brain tissue in EV71 infected neonatal mice, and then the peptides of EV71 that could induce cross-reactivity with brain tissue were identified, which should be avoided in future vaccine designing. Human enterovirus (EV71) was first described by Schimdit et al. in 1974 , which belonging to Picornaviridea family and has a single positive stranded ribonucleic acid (RNA) of about 7,500 nucleotides [2, 3]. There have 13 large and small reported outbreaks of EV71 throughout the world since then, which main leads to high prevalence of hand, foot and mouth disease (HFMD) in infants and children under 6 years old [4–6]. In past decades, countries in the Asia-Pacific region have experienced an increased occurrence of EV71 associated HMFD outbreak [7–11]. Most of EV71 infection are benign and self-limited in nature, however, EV71 infection has been reported to cause neurological disease manifesting as aseptic meningitis, encephalitis or poliomyelitis-like acute flaccid paralysis, and neurological originated pulmonary edema or hemorrhage was the main reason of lethal symptom [4, 12]. The central nervous system (CNS) injury dependent EV71 neuropathology is supposed as the main reason kills neuron and then lead to subsequent neurological destruction [4, 13–18]. Although a certain numbers of research work have been carried out, as no abundant virus titer was detected in the CNS during EV71 challenge in mice model, meanwhile, the attenuated EV71 strain can still induce weak neurological symptoms in monkey, the detailed mechanism of CNS dysfunction is remained to be clarified [15, 19]. EV71 virus infection was reported to increase the permeability of BBB [20, 21]. However, as enter of virus into cranial was dependent on a retrograde axonal neuronal transmission way, the increased permeability in BBB was presumed not essential for virus through BBB. As described in Epilepsy, self immunity caused by the common antigens between virus and cell receptors lead to neuron injury, in which the central nervous system (CNS) is attacked by the immune system and that provide a inspiration for the possible new way during the pathology of EV71 infection study . In current study, the sera isolated from EV71 infected patients were indicated to cross reaction with the human tissues of cerebrum by immunohistochemical staining and then the regions can elicit cross-reactivity with normal brain tissues were identified. A large outbreak of HFMD in infants and children was happened in Fuyang region of China in the spring of 2008 [23, 24]. Thirty sera from children with HFMD was collected, who was infected with EV71 after RT-PCR diagnosis the specimen of throat swab, and the presence of EV71 induced antibody (both IgM and IgG) in all the thirty sera was verified by ELISA (data not show). As neurological pulmonary edema or hemorrhage was the main reason of lethal symptom [25, 26], and our inactivated virus vaccine showed neurological virulence while applied in primates test (date not show), the 30 sera from EV71 infected patients were used as primary anti-sera to perform the immunohistochemical staining with adult human tissues of cerebra (Fig. 1). The normal sera from five donors (four children and one adult) were used as negative control, in which the anti- EV71 IgG and IgM was free with ELISA analysis. The human tissues of cerebra was not stained obviously with negative control sera (Fig. 1B-F), while the human tissues of cerebra was stained on the neuron glial cell, neuron and stroma by the patients sera (Fig. 1G-L). The positive staining was observed in all of the 30 sera from EV71 infected patients and 86% of the 30 sera showed cross reaction with 10-40% stained cells (Table 1). 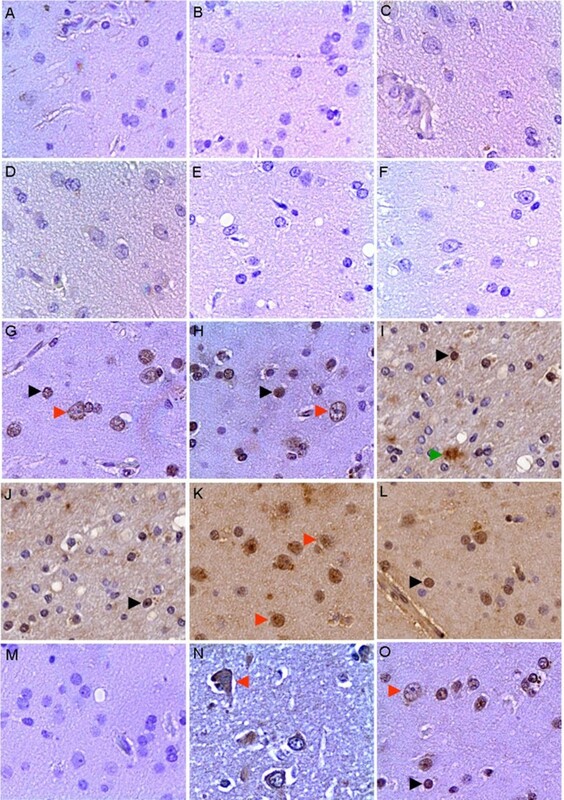 To exclude the interference of remained ingredients in sera, the IgG fraction in three sera samples were purified and used as primary antibodies in immunohistochemical staining with human brain tissues, and the results were consistent to sera's experiment in neuron glial cell and neuron, but not in stroma (Fig. 1M-O). These results indicated the presence of specific IgG in the EV71 infected patient sera having the cross-reactivity activity to human cerebra and suggested that some EV71 antigens could induce cross-reactivity to human cerebra. The expression and purification of the peptides disassembled from EV71To identify the regions of EV71 virus that can induce antibodies binding with human brain tissue, the genome of EV71 was divided into 22 regions in sequence, which encode peptides between 22~156 amino acids (Fig. 2A), and the nearby fragments in a functional gene have 12 to 39 bp overlap to avoid the miss of epitope. EV71 of Fuyang-0805 strain isolated from Anhui province of China was used as the templates for primers designing and RT-PCR (see Additional file 1). 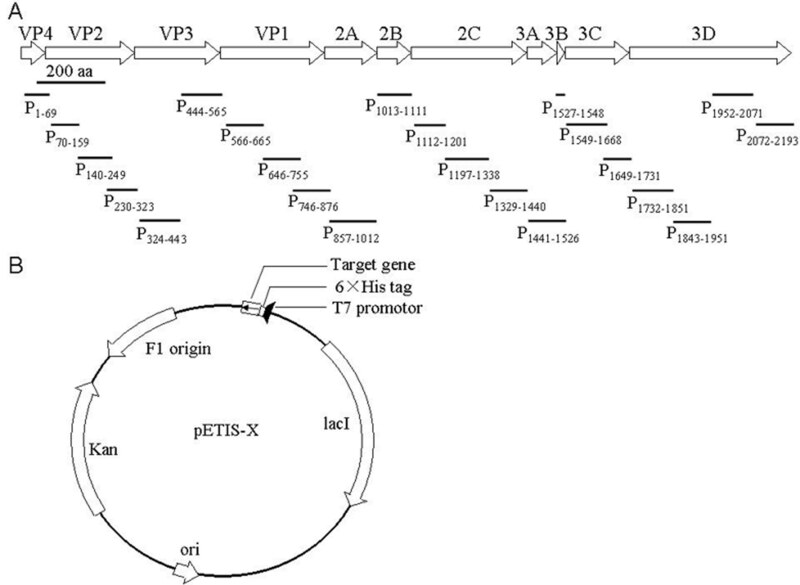 Targeted cDNA fragments were cloned into pETIS vector modified from pET28a (+) (Fig. 2B), and then the fusion peptides with six histidine residues tag were over-expressed. Nineteen of the 22 targeted cDNA fragments were synthesized in insoluble inclusion body forms by E. coli, but three of them, P1013-1111, P1112-1201 and P1527-1548, were failed to expression in this bacteria strain. After Ni-HTA purification, all of the 19 peptides were purified to a purity of 95% (see Additional file 2). Cross reaction of the IgG from EV71 infected patients' sera with human tissues of cerebra. The serum was replaced by PBS buffer as blank control (a), and naive sera from five health donors were used as negative control (b-f). The sera of CNILASTB-16 (g), CNILASTB-19 (h), CNILASTB-1 (i), CNILASTB-2 (j), CNILASTB-4 (k) and CNILASTB-9 (l) were used as primary antibodies in immunohistochemical staining with the cerebra of adult. The IgG fraction in the sera of NORMAL-1 (m), CNILASTB-12 (n) and CNILASTB-4 (o) were used as primary antibodies in immunohistochemical staining with the cerebra of adult to exclude the interference of the remained ingredients in sera. The stained glial cell, stroma and neuron were denoted with black, green and red arrows respectively (×200). Diagrams of divided 22 peptides from EV71 and expression construction. The position and length of 22 peptides divided from EV71 (a) and expression constructs for 22 peptides (b) were diagramed. + + + + 31%~40% cell was stained. The 19 purified peptides were applied to immunize the 6 weeks female ICR mice according polyclonal antibody preparation procedure described in the Method. The sera of immunized mice were collected, and the titers of IgG against EV71 in the sera were determined by ELISA respectively (Table 2). No lesions in any of the brain tissues of immunized mice were observed (data not show), then, the 19 sera were applied in immunohistochemical staining to identify which sera have cross reaction with human adult and fetus brain tissues, respectively (Fig. 3). The anti-sera of P230-323, P646-755, P857-1012 and P1329-1440 showed strong staining with neuron plasma in both adult human cerebra and fetus medulla compared with the negative control (Fig. 3A-D). The anti-sera of P1-69, P324-443, P444-565, P566-665, P746-876, P1441-1526, P1549-1668, P1732-1851, P1952-2071and P2072-2193 showed weaker staining with the human brain tissues than the anti-sera of P230-323, P646-755, P857-1012 and P1329-1440 (Fig. 3E and 3F). The anti-sera of P70-159, P140-249, P1197-1338, P1649-1731, P1843-1951 did not show staining with both the adult human cerebra and fetus medulla sections (Fig. 3G and 3H). This result indicated that the peptides of P230-323, P646-755, P857-1012 and P1329-1440 could induce strong IgG cross-reactivity to human brain tissue. The significant of cross reactivity was not relevant to the specific IgG titer induced by individual peptides (Table 2), which indicated the cross reactivity was a specific IgG behavior rather than an antibody dose dependent artifact. Identification of EV71 fragments inducing cross immunity to human brain tissue by immunohistochemical staining. Left panel was adult human cerebra and the right panel was human fetus medulla. The naive mice sera was used as negative control (a & b). The serum of immunized mice with peptide of P646-755 was one of the four strong cross immunity peptides(c & d). P2072-2193 was one of the ten weak cross immunity peptides (e & f). P140-249 was one of the five no cross immunity peptides (g & h). The serum of immunized mice with heat inactivated virus was used as positive control (i & j). The staining sites were denoted with arrows (×200). a the sera were used to determine the titer to its self peptide in a dilution 1:50,000.
b the sera were used to determine the titer to virus in a dilution 1:1,000. Values represent means ± SD of three independent experiments. An EV71 mice infection model was build in our laboratory (unpublished data), neonatal mice were intraperitoneal infected with 5 × 105 TCID50 virus within 24 h after birth, the virus replication was detected in brain, lung, small intestine and skeletal muscle at 5 dpi by Real-time PCR and virus titer determination in RD cell, respectively. Then, the virus locations in these tissues were verified by immunohistochemical staining with a monoclonal antibody of EV71 (Millipore). Large area of neuron apoptosis was observed in cerebrum and medulla of brain tissue. In small intestine, intestinal villus interstitial edema and epithelial cell vacuolar degeneration were observed. In skeletal muscle, inflammation, muscle fiber degeneration and necrosis were scarcely observed. However, although virus replication and virus antigens were detected in lung, no obvious lesion was observed in this organ. As no lesions in all the brain tissues of immunized adult mice were observed, we studied the BBB permeability of neonatal mice upon EV71 infection. Naive or EV71 induced IgG was intravenous injected into the neonatal mice upon EV71 infection or not, respectively. And the detection results were shown in Fig. 4, both weak staining sites were observed in EV71 infected mice brain tissues after naive or EV71 induced IgG injection (Fig. 4B and 4D), while the staining was scarcely observed in normal mice brain tissue after IgG injection (Fig. 4A and 4C). And the intracranial IgG showed a weak diffused distribution in the brain tissue of EV71 infected mice, which indicated that compared to normal neonatal mice, the BBB permeability of EV71 infected mice was increased and permits both the naïve IgG and EV71 induced IgG entry. Detection the intracranial IgG in mice after intravenous injection. The normal neonatal mice injected with naive IgG. (a), EV71 infected neonatal mice injected with mice naïve IgG. (b), normal neonatal mice injected with EV71 induced IgG. (c) and EV71 infected neonatal mice injected with EV71 induced IgG. (d) were compared by the immunohistochemical test. The staining sites were denoted with arrows (× 200). The HFMD occasionally causes a series of severe neurological symptoms, including aseptic meningitis, encephalitis, poliomyelitis-like paralysis and neurological originated pulmonary edema or hemorrhage [25, 27–29], especially the latter was the main reason of lethal symptom in infants and children [4, 12]. Previous study suggested the neuropathological symptom was caused by the EV71 infection in CNS [30–34]. However, Chen CS et al. reported that although the infection led to a persistent viremia and a transient increase in BBB permeability, but only low levels of virus could be detected in the mice brain , and Arita M et al. reported that the monkeys vaccinated with an attenuated EV71 showed the broad range of CNS tissues inflammation related to the peak stages of IgM and IgG producing, but without the efficient virus replication . Those results suggested that the pathogenesis of neurological symptoms with HFMD may have more mechanisms. We find that all of the tested EV71 infected patients' sera were presence of IgG to cross-react with health human brain tissues (Fig. 1), which suggested that a potential cross-reactivity of EV71 with human brain tissues. To identify the fragments of EV71 that induce cross-reactivity to human brain tissue, the whole genome of virus was divided into 22 fragments sequentially. The 19 of 22 fragments were successfully expressed and purified, however, 3 fragments was failed to expressed in prokaryote environment and those were given up. For cross-reactivity assay, the polyclonal mouse anti-sera against the 19 peptides were prepared and applied in the immunohistochemical analysis with the adult human cerebra and fetus medulla. The results indicated the 19 peptides can be divided into three groups according the cross reaction activity. There were 4 peptides showed strong cross-reactivity with human brain tissues. There were 10 peptides showed weak cross-reactivity with human brain tissues and there were 5 peptides showed no cross-reactivity with human brain tissues. Sera of patients and the strong cross-reactivity peptides showed a similar pattern on the staining of neuron of the human brain tissues (Fig. 1 and 3). These suggested the strong cross-reactivity peptides were potential common antigens of the EV71 with human brain tissue, however, the brain binding partner of EV71 induced IgG was not identified in this work. The peptides that elicit antibodies can bind to human brain tissue was dispersed in whole proteome of EV71, rather than gathered in one or several structural proteins. So, the potentially self-reaction antibodies would be induced over the whole process of virus infection including virus invasion, propagation and releasing. In previous study, both attenuated and avirulent virus or virus like particles were able to induce significant neutralization antibody, relax the clinical symptoms and reduce mortality rate of laboratory animals upon lethal virus challenge[19, 35, 36]. As indicated in cynomolgus monkeys, although an attenuated EV71 strain showed obvious protection activity in vivo, the inoculated monkeys still manifested weak neurological symptom. VP1, located in the surface of virus particles, was thought as the predominant epitope clustering protein, has been broadly used as subunit vaccine to substitute whole virus and elicit significant protection on neonatal animals [37–42]. However, the IgG induced by P646-755, which belongs to VP1, elicited strong cross-reactivity to human brain tissue, so the neurological safety of whole virus or VP1 protein as vaccine should be concerned before clinical application. Many disease and virus infection, especially the neurological disease can increase the BBB permeability, e.g. stroke, human immunodeficiency virus, Alzheimer's disease, brain cancer, and bacterial infections of the CNS [20, 21, 43], likewise, the increased BBB permeability after EV71 infection was verified in a mice model . Our result also indicated the increase of BBB permeability after EV71 infection in infant mice and further more, the increase of BBB permeability after EV71 infection could result in the entrance and localization of the IgG into brain tissues. Autoimmune disease was reported in many previous studies, such as celiac disease, sclerosis, encephalitis, Diabetes mellitus [44–48]. As the BBB in infant can be destructed upon EV71 infection and the EV71 can induce cross-reactivity IgG, therefore, whether the intracranial entry of EV71 elicited IgG is one of the mechanisms of neurological pathogeneses in HFMD patients was remained to be clarified in further study. However, the cross reaction fragments of the viruses should be concerned in future vaccine designing. In conclusion, this study initially showed the cross-reactivity between EV71 induced IgG and human brain tissue, and the peptides of EV71 that can bring IgG based cross reaction was identified. We observed the increase of BBB permeability in neonatal mice under EV71 infection and the entry of brain cross reactivity IgG, which was supposed play a role in subsequent clinical symptoms. 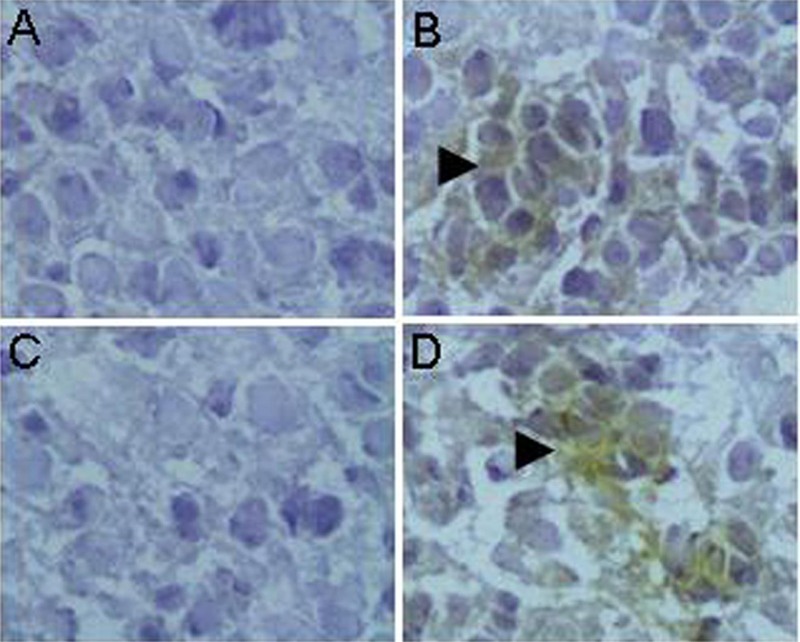 RD cells (human rhabdomyosarcoma) were maintained in Dulbecco's modified Eagle's medium with 10% fetal bovine serum . EV71 FuYang stock virus strain (Fuyang-0805), which belongs to C4, the predominant genotype in recent outbreaks in Asia (GenBank accession number EU703812) was grown in RD cells as described by He YQ et al. and Lin JY et al [50, 51]. The infected cell culture was disrupted by three freeze-thaw cycles, then the cell debris was removed by centrifuged at 3,000 g for 20 min, the virus was collected by centrifuged at 80,000 × g for 3 h, and then was ected was pur normal neuron resuspended in phosphate buffered saline (PBS)  to prepare the working stocks containing 108 TCID50/ml . The EV71 genomic RNA was extracted from the culture fluid of infected cells using a High-pure viral RNA purification kit (Qiagen). Reverse transcription-PCR (RT-PCR) was performed using a ReverTra-Plus kit (Invitrogen) to clone the full length cDNA . The EV71 cDNA was used as template for peptide coding regions amplification. The primers and associated restriction enzyme sites were subjected in Additional file 1. The cloned fragments were inserted into cloning sites of pETIS vector under the T7 promoter and His tag was added at the N-terminal of the target peptide to form a fusion peptide with His tag. The expression plasmids were verified by sequencing analysis respectively. Escherichia. coli BL21 (DE3) was transformed by the constructed expression plasmids for protein expression. The DE3 bacteria strain was cultured with Luria-Bertani (LB) medium with 50 μg/ml kanamycin at 37°C, 200 rpm. After the OD600 of culture up to 0.6, the IPTG was added to a final concentration of 0.5 mM into the medium and cultured for 8 h at 25. The bacteria pellet was harvested by centrifugation at 4, 000 × g for 20 min, and the expression of targeted proteins were detected by SDS-PAGE. Protein purification was performed according to the protocol of Novagen with Ni-HTA resin. Briefly, the bacteria pellet was resuspended in buffer B (8 M urine, 0.1 M sodium phosphate salt, 0.01 M Tris-HCl, pH = 8.0) and incubated at 37°C for 30 min, the cell debris was removed by centrifuged at 20,000 × g for 20 min. Then the supernatant was loaded onto a Ni-HTA resin column. The column was washed with 10 fold column volumes of washing buffer C (8 M urine, 0.1M sodium phosphate salt, 0.01 M Tris-HCl, pH = 6.3). The target protein was then eluted with buffer D (8 M urine, 0.1 M sodium phosphate salt, 0.01 M Tris-HCl, pH = 4.5) and dialyzed against 0.9% NaCl, and then the purity of peptides were detected by SDS-PAGE. The concentration of protein was measured by Bradford method . ICR mice were provided by the Institute of Laboratory Animal Science, Peking Union Medical College. All the mice were bred in an AAALAC-accredited facility and the use of animals was approved by the Animal Care and Use Committee of the Institute of Laboratory Animal Science of Peking Union Medical College (GC09012). The adult mice were used for polyclonal antibody preparation. The peptides were dissolved as 1.0mg/ml of each peptide in 0.9% NaCl and then formulated with same volume of Freund complete adjuvant (Sigma) according to the manufacturer's instructions. The injected dose of the peptides was 100 μl/mouse given through intraperitoneal injection (i.p.). The heat inactivated EV71 were dissolved as 1.0 × 109 TCID50/ml in 0.9% NaCl and the injected dose of the virus was 100 μl per mouse. One week after the first injection, the animals were boosted at the same dose of peptides or the heat inactivated virus formulated with same volume of Freund incomplete adjuvant (Sigma) through intraperitoneal injection(i.p.) and the mice were reboosted weekly for 2 times. The levels of specific IgG against EV71 or peptides from the immunized mice or EV71 infected patients were determined by enzyme-linked immunosorbent assay (ELISA). Briefly, microtiter plates were coated with 100 μl of heat inactivated virus (1.0 × 108 TCID50) or peptides (10 μg/ml) in carbonate coating buffer (15 mM Na2CO3, 35 mM NaHCO3, pH 9.6). The plates were incubated at 4°C overnight and then incubated with 1% BSA in PBS for 2 h at room temperature to prevent non-specific binding, serial dilutions of test sera were added to each well and incubated for 1 h at 37°C, followed by horseradish peroxidase (HRP) conjugated goat anti-mouse IgG (1:5, 000 dilution, Sigma). The reaction was developed by 100 μl TMB substrate (3, 3', 5, 5'-etramethylbenzidine), and then terminated by 100 μl 2 M H2SO4. The optical densities at 450 nm were determined . The cerebra and medulla of human brain tissues were from an adult and a fetus, who were both died in accidents respectively. The usage of human brain tissues and sera were permitted by Institutional Review Board (IRB) of FuYang people's hospital, where these samples were provided. For immunohistochemical staining, brain sections were deparaffinized with xylene, rehydrated in ethanol, and then treated with 0.25% trypsin solution with 0.5% CaCl2 in PBS for 30 min and incubated in 1% hydrogen peroxide in methanol to block endogenous peroxidase activity followed by incubation with 10% Block Ace (Sigma) in PBS. The treated sections were incubated with specific serum (1:200 dilution for patients' sera and 1:1000 dilution for mice sera with 0.05% Triton ×-100-PBS) or purified IgG fraction (1 μg/ml) from sera of EV71 infected patients at 4°C overnight. The sections were washed three times with PBS and then incubated with HRP-conjugated goat anti-human IgG (for patients' sera, 1:500 dilution, Sigma) or HRP-conjugated goat anti-mouse IgG (for innunized mice sera, 1:1000 dilution, Sigma) for 1 h at 37°C. The sections were developed with 3-3'diaminobenzidine (DAB) and examined with a light microscope . IgG fraction of sera from EV71 infected patients or immunized mice were purified by Protein A conjugated agarose affinity adsorption column . The mice serum was diluted in 5 volumes loading buffer: 20 mM PBS saline buffer (pH, 7.0) and loaded on a Protein A agarose affinity adsorption column. Then, after washing by 10 volumes loading buffer, the targeted IgG was eluted by 0.1 M citric acid (pH, 3.0) and dialysis against PBS buffer overnight at 4°C. 10 μg IgG were intravenous injected into neonatal mice in 2 days later after EV71 infection, and the mice were sacrificed with barbital anaesthesia in 1 days later, then the brain tissue sections were prepared to detect intracranial IgG . IgG presence in brain sections were detected by immunohistochemical staining with HRP conjugated goat anti mouse secondary Ab (1:5,000, sigma) and developed with 3-3'diaminobenzidine (DAB) and examined with a light microscope. This work was supported by national sciences and technology major project (2009ZX10004-402). JCS and LJN conducted all experiments except for the Immunohistochemical staining and draft the manuscript. MCM, HY and XYF performed Immunohistochemical staining. LSZ, GXZ and LXL collected the EV71 infected patients sera. LWB and ZLF designed the experiment and edited the manuscript. QC provided overall supervision, financial support and prepared the final version of the manuscript. All authors read and approved the final manuscript.